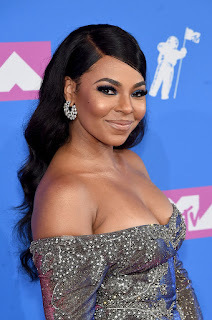 Ashanti is a music industry veteran. Besides her own hits, she's been writing for years. Is it any wonder she'd choose the VMAs to self plug a song she wrote for J.Lo, who performed and received the Michael Jackson Video Vanguard Award? I mean, it is a royalty check for her after all. On that note, she served face but was never really one for slaying her red carpet looks.